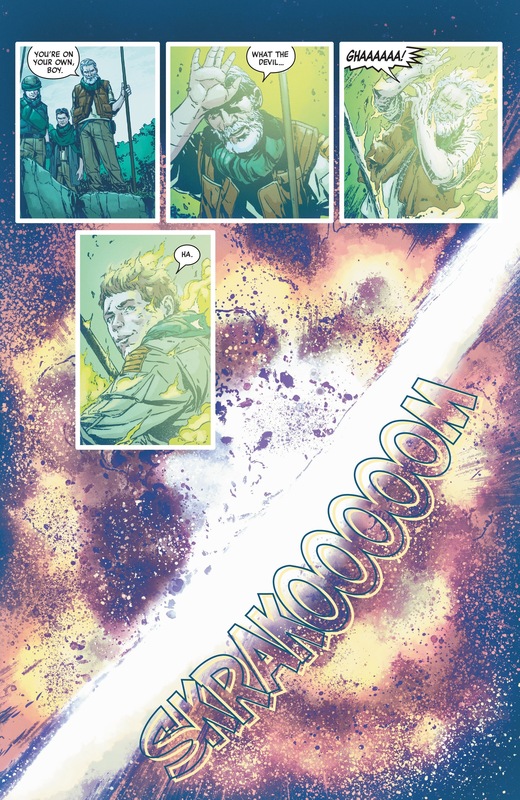 "Oh, he's like virtually every other bad guy in Star Wars who doesn't have blue skin. He's super duper evil. If he hasn't kicked a field goal with a puppy, he's just not happy that day." Wouldn’t this be OOC for Tarkin? I mean he got on Vader for the same exact thing! Tarkin just killed several people who completed their duty because they “hesitated” for a second. Tarkin is more of the "power Hungry" kind of villain. He is the kind of villain who takes advantage of a situation to earn recognition, rather than a sense of "loyalty", which is why he is so happy to join Palpatine's empire. He would not blow his own planet out of a sense of Loyalty... he would do it for the promise of a new shiny thingy in his chest. Yeah. I can see him firing them, or even just giving an order that he wants them gone and more disciplined troops brought in, and leaving the details to a subordinate. Him spacing them for something relatively minor is OOC. Maybe he'd space Alderaan guy if he thought that he'd tried to stop it, but I don't see him personally attending to it. He'd sign the order for him to be executed then leave the rest to a minion. He'd tell Vader to do it. Maybe for early Tarkin it could be. However, I can imagine Tarkin at this point, with the Death Star proven and his power seemingly certain, to figure he can get away with a lot. There was an idea that Tarkin was secretly plotting to use the Death Star in a coup on Palpatine so can easily see him figuring "what's a couple of guys when I'll be in charge soon?" 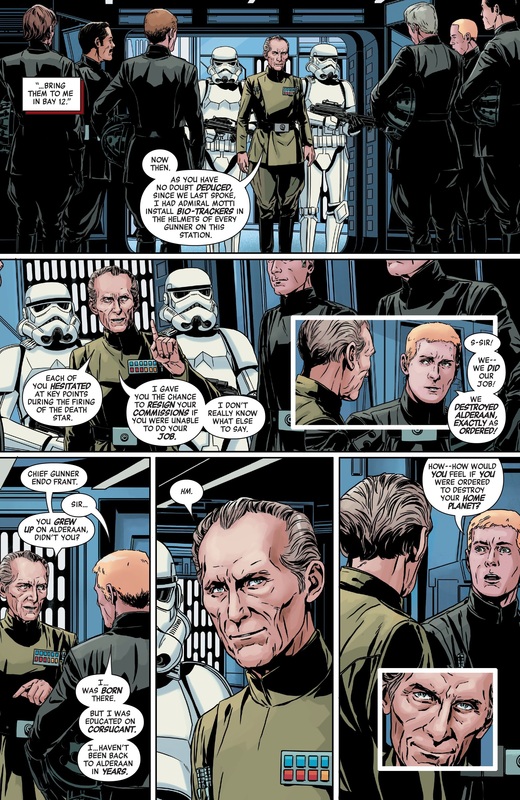 Tarkin want's to establish himself as a ruthless leader, if he defers all such decisions to Vader, then it's not his reputation that's being embellished, because Vader tends to overshadow such things by his presence, which is useful, but is not a constant presence. Doing it himself sends a message to his crew that it's not just Vader they should fear, but him. I don't know. 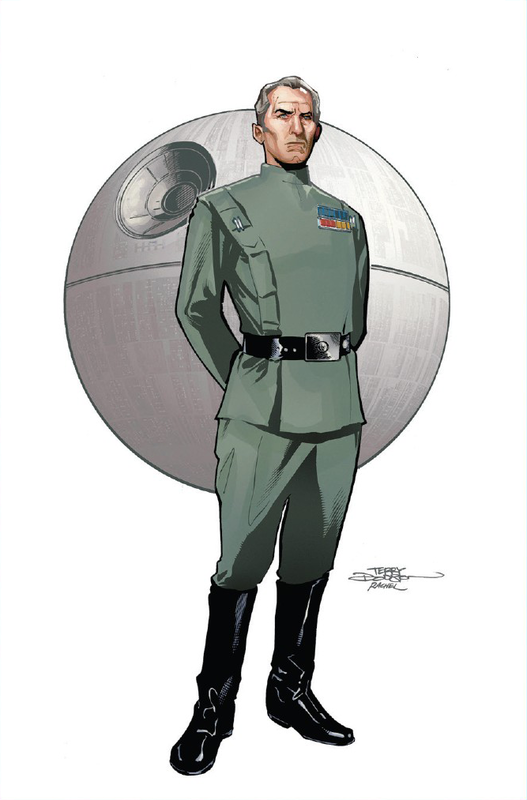 Tarkin is the guy who blew up an entire planet for basically no reason. That's a lot of the Empire's valuable land, resources, and taxpayers wasted. 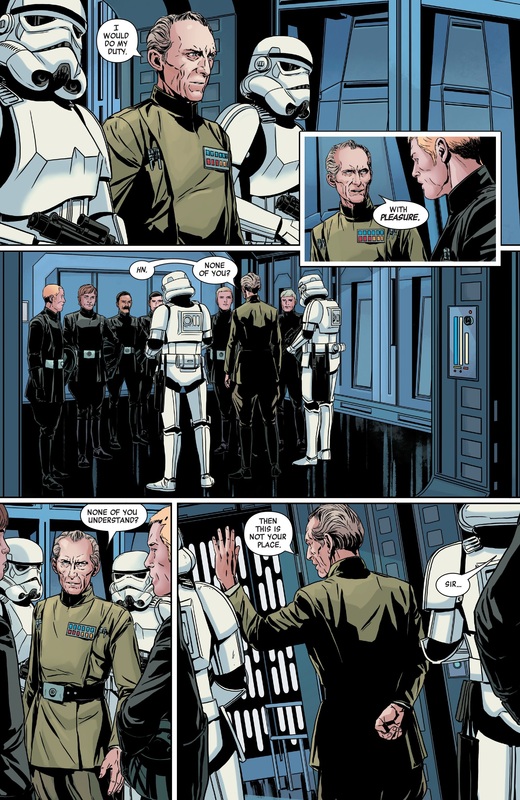 You can argue that a Tarkin backstory issue is unnecessary but at least it's kind of interesting. Kind of a look on men and fascism. A version of masculinity that celebrates abuse, anger and dominance. A mindset that would almost be comedically mockable if it wasn't for the fact that men like that killing people. Shame Marc Laming isn't drawing the mainline star wars book, he can get the actor's likenesses without making the art look stiff and lifeless. Yeah Larocca‘s stuff is just stilted and unnatural to me. I was reading the Vader series he did and he was copying the same screenshots of Palpatine throughout the book. I’d rather have more cartoonish art because it would at least feel more fluid. To be fair, for stuff like the silkscreen Mondo movie posters the actor/studio have to approve the posters before they go to print and likeness with the actors is sometimes part of that. 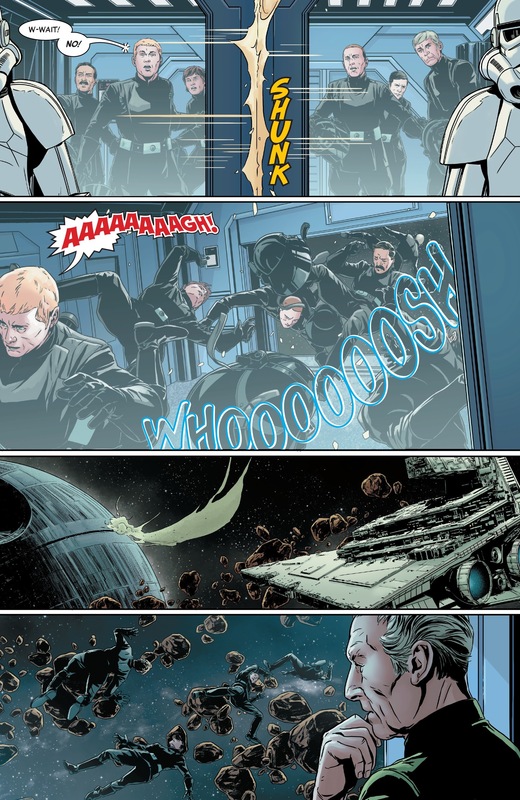 The photo-referencing has been so prevalent in the Star Wars comics that it might be a similar situation with Lucas. They have to hire artists who do more photo-referencing rather than a cartoonier look as a way to cover themselves and get the art approved. An picky AD at Lucas can't say a character doesn't look like Han Solo when it's traced from an Han Solo screenshot. Which also leads to stiffer compositions since you're way more restricted in what will look natural. I do like Larocca's design-sense. Some of the new concepts he made for the universe are really cool-looking. But even his non-star wars comics look stiff sometimes. James Luceno's " Tarkin ", this is not. This reminds of one of (imo) good bits of old EU canon, Tenn Graneet the reluctant Death Star gunner who actually pulled the trigger on Alderaan and ended up wracked with guilt and hesitated to do the same to Yavin 4. We also met a younger Tarkin in The Clone Wars cartoon, where he meets Anakin for the first time, and puts forward the very reasonable argument that he respects the Jedi for their role as peacekeepers, but argues that they should NOT be generals in the Army of the Republic. In a war, you can be a peacekeeper, or a soldier, but not both. I always figured the Jedi shouldn't be generals because they're not generals. Being a super-powered warrior monk doesn't make you good at strategy or logistics. Well, the Jedi were only made generals because of a throw-away line in A New Hope ("General Kenobi, you served with my father during the Clone Wars"). Thanks to the Greedo Effect (Greedo is a bounty hunter, therefore all Rodians also aspire to be bounty hunters because all aliens have mono-cultures) all Jedi must therefore be generals during the Clone Wars. But you do have the best ever excuse for losses. "The Force willed it." I'm surprised more Jedi don't use it in their everyday lives. "Hey, you cut the line!" "Force willed it." "Stop double dipping!" "Can't. Force wills it." "Did someone take my sandwich from the fridge?!" "Force willed I eat it." So, shirtless Tarkin vs CGI Tarkin. Which one is more disturbing? When I was a kid, somebody told me Lucas didn't have much budget and even less fame when he made the first Star Wars, now episode IV. So, the only popular actors he could afford were Peter Cushing (ex horror movie actor) and Alec Guiness (ex shakespearian actor) who were both way past their fame days, and took the job because they didn't have much choice. It makes sense, but I never could find any confirmation about this. true to a point. Altough nowhere near as famous as after the ludicrous success of Star Wars, George Lucas already had the highly succesful "American Graffiti" under his belt and was already friends with both Spielberg and Coppola, so he wasn't entirely unknown. On the Budget side, it had a 11M Budget. which yes, seems small... now... but it is actually almost twice as the budget of The Godfather and 2 millions above Jaws' 9M budget. as a sidenote, Superman, released 3 years later, was the most expensive movie at the time, with a budget of 55M. The reason why the biggest names he managed to get were Cushing and Guiness was because, honestly, nobody believed in the project. Something like Star Wars, at the time, sounded a lot like cheap low quality B-Movies that people went to see more for the "So bad it's good". Most people who rejected the project did so because they thought themovie would hurt their reputation. Those people who rejected it weren't wrong at the time. Science fiction movies had their occasional gems like The Day The Earth Stood Still and Forbidden Planet, but were still considered B-movies and more a Flash Gordon cheapie serial sort of thing. A New Hope debuted at just the right time. After more than a decade of antiheroes and nihilism and gritty, depressing films, people were ready for something upbeat again. After the turmoil of the '60s and Vietnam and Watergate, people were ready to celebrate the Bicentennial and feel some kind of optimism again. Rocky had given them that in '76, and the next year, A New Hope burst onto screens with state-of-the-art special effects and a triumphant Good vs. Evil storyline. Moviegoers were ready for that again, but before the film debuted, no one connected to it had a clue. Star Wars was transparently going for Space Opera, so it played to a different aesthetic (many of those films are dramas with SF elements). That said, a LOT of famous actors were offered roles, but turned them down for other reasons. Kurt Russell took guaranteed work over Lucas not making a decision fast enough; Al Pacino didn't get it and had lots of offers at the time; Christopher Walken, too, was getting lots of work and took a sure thing when it came rather than wait to see if he got cast. It wasn't that they couldn't get actors: it's that Lucas took a long time to make choices, as often as not, and actors gotta eat. Sir Alec Guinness wasn't desperate for work; he was turning work down at that point. He wasn't rich, but could afford to be choosy if he wished (and turned down working with David Lean not long before he was cast in Star Wars (the director of Bridge over the River Kwai, Doctor Zhivago, Oliver Twist, Lawrence of Arabia...). So he wasn't taking just anything...but he got a great deal on Star Wars that made him very comfortable for the rest of his life. And Peter Cushing basically never said no to work, period (even after his wife died in 1971, something that had him 'marking time until he died' for several years). The idea that Star Wars couldn't land big names doesn't really hold up to the record, afaict, but there were definitely some actors who were confused by the whole thing and took surer things...but usually AFTER they'd done an audition. A friend of mine in the UK was very heavily into the fan culture at the time, with Fanzines that were copied up and mailed out to mailing lists. Smelling vaguely of solvents form he copying techniques of the time. Sufficiently big in the culture to get an invitation to the pre-release of the first movie. I've seen the promotional material, shes still got it. It seems it was adjusted a little after the first sceeening. The book, as I remember it went "From the adventures of LUKE SKYWALKER, his battle with his enemy, THE GRAND MOFF TARKIN! and the in much smaller type "and his lieutenant Darth Vader." I'll see if I can take a photo of it and post it here this summer when I'm in the UK. Yeah, Lucas wasn't sure that Vader alone would be a seller (especially as you don't see his face and Lucas was convinced you needed a human enemy for some points)...and in the UK, I hear that they leaned into Cushing as the Big Bad for marketing materials(I've never seen this, but afaik it was used in some part). It sounds kind of crazy NOW, but back then when it was an untested property, it made sense.